Here you will learn how to use the reporting side of the Behaviour Module, showing you its many features, types of reporting and how to access them. If you wish to see which reasons have been added to a student and when. Click on their name to bring up the Student Profile and then select the new Points tab. 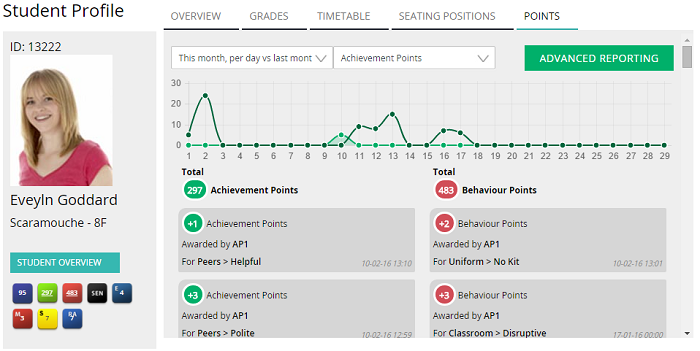 Here you will see all behaviour and achievement points assigned to the selected student and you have the ability to choose different views at the top of the screen. Above you can see all of the Achievement points in the last month compared to this month. Above are all of the Behaviour points that have been added to the student in the last month compared to this month. Click on the Advanced Reporting button within the Student Profile or click on Reporting at the top of the screen. There are a number of reports that you can run from here. Obviously some of these will only make sense once your school has been using MINTclass Behaviour Module for some time. On the following pages, there are some example reports that you could run within this area. This shows you the top of the students overall and by selecting the Year you will see the top students in that year group. 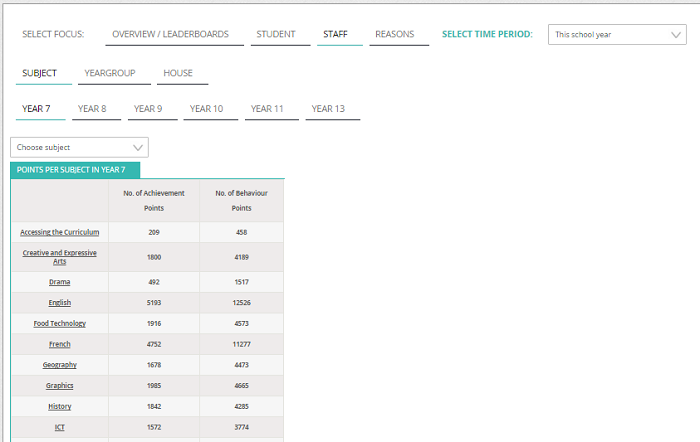 By selecting students at the top of the screen you will see totals by year group. If you click on a year group on the left of the screen you will see the breakdown by class. By selecting staff, at the top of the screen you will see a breakdown by subject. By clicking on the subject you will see a breakdown by staff name so you can see which member of staff is adding which reasons to which classes etc. Finally, by clicking on the reasons tab at the top of the screen you can see which reasons have been used. A number of new reports have been added to show the additional functionality. These reports can be found in the Other Data section at the top of the screen. We updated reporting in March 2019. 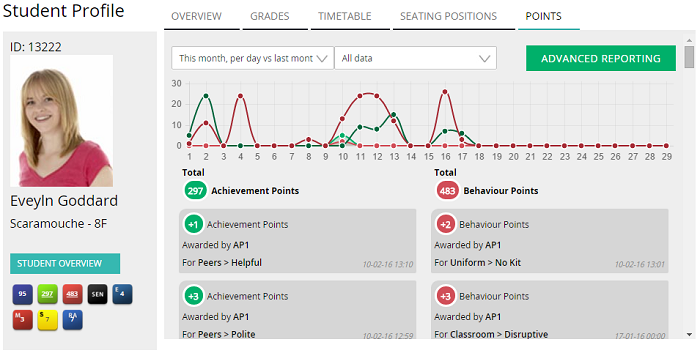 We are constantly adding to our Behaviour and Achievement reporting repository and after receiving a number of requests for ‘date range' filter, Achievement or Behaviour only filter we have added these to this build. There are more to come so keep an eye out for further releases this year. You need the Writeback module to access this. If you would like further information on the Writeback module please email sales@tucasi.com or click here. Click on Reporting at the top of the screen or click advanced reporting from any student profile. In the top right-hand corner, you will now see the options shown below allowing you to filter to just achievements, just behaviours or all. The default setting is Overview for All data for all year groups. If you select Achievement you will of course only see achievements for the whole school. Your filter selection will remain as you drill down through year groups, form groups, house, staff and students. The date range filter has been added to the Select time period drop down. Once selected you can choose any date range within the academic year and view just that data. You will need to select Student, Staff etc at the top of the screen to enable the date filters. Click the start date and select the date from the calendar. Next, select the end date. You will now see all the data for that date range. You can of course also filter to just achievements or behaviours if you so wish.